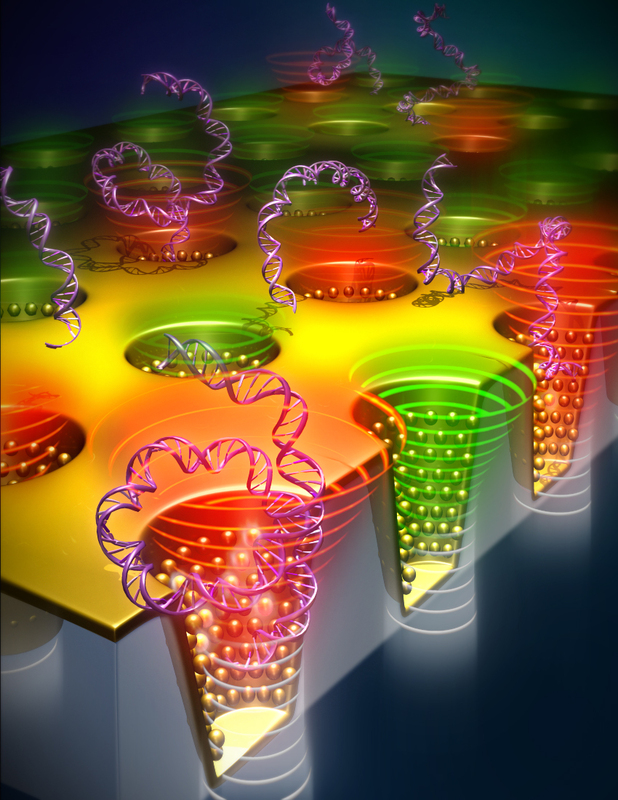 Inspired by a marvel of ancient Roman art glass, researchers at the University of Illinois at Urbana-Champaign have designed a device that uses inexpensive light-sensitive plastics to do DNA, drug and protein analysis. 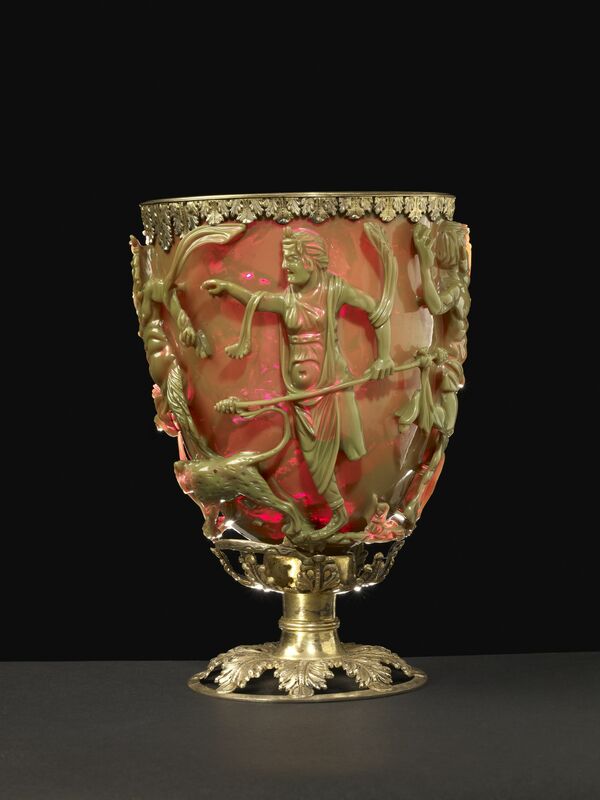 The British Museum’s Lycurgus Cup is made out of dichroic glass, glass with added nanoparticles of gold and silver which alter the color of the glass depending on how the light hits it and where the observer stands. The cup looks green in reflected light (light shone directly on it) and red in transmitted light (light shone behind and through it). The nanoscale Lycurgus cup arrays (nanoLCA) device takes a cheap piece of plastic about the size of a postage stamp imprinted with a billion little nanodents which are then sprayed with gold and silver nanoparticles, thus creating a billion little Lycurgus Cups. When substances are poured into the wells, they display a range of green to red colors which can be used to identify the substance. It’s exceptionally sensitive, more so than many fully realized sensors in action today, and the color change makes data that could once only be identified with precision spectrometers or fluorescence labeling easily visible to the naked eye or regular color photography. You can read the full article published in the journal Advanced Optical Materials here for free. Fair warning: it’s highly technical. Unless you have a solid chemistry and/or optics background, there will be copious Googling. Oh yes, there will be Googling. If this technology pans out past the prototype stage, instead of complex, bulky, extremely expensive stationary equipment like spectrometers which require a hospital or well-appointed laboratory, scientists will be able to run a range of tests on the spot using a nanoLCA device in their cellphones. Samples of urine or saliva will be able to be tested for the presence of antibodies or pathogens. Samples of liquids will be able to be tested for explosives, chemical or biological agents at border crossings. Its versatility and portability would make it a jack of all trades, a sort of Lycurgus Cup tricorder. I find it particularly delicious that so cheap and convenient a device is modeled after an antique artifact that was an incredibly rare, hugely expensive luxury even when it was new in the fourth century. 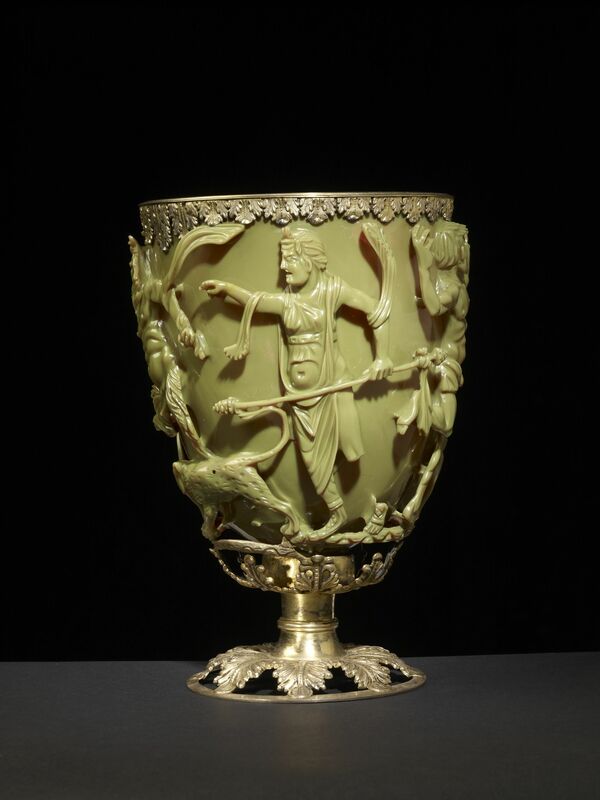 Just over six inches in height and five inches in diameter, the Lycurgus Cup is unique. 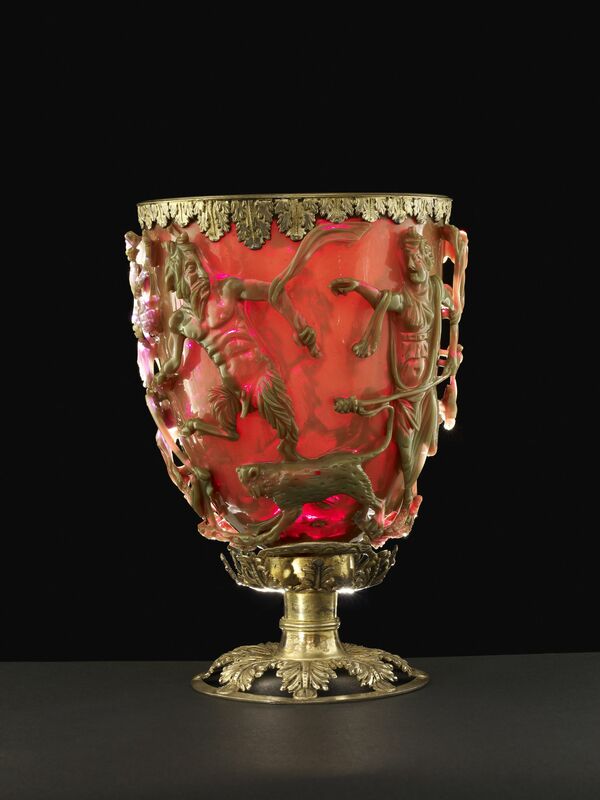 Not only is it the only complete Roman object made out of dichroic glass to survive, but it’s the only extant dichroic glass to have so extreme a color shift, from opaque jade-like green to a deep translucent ruby red. 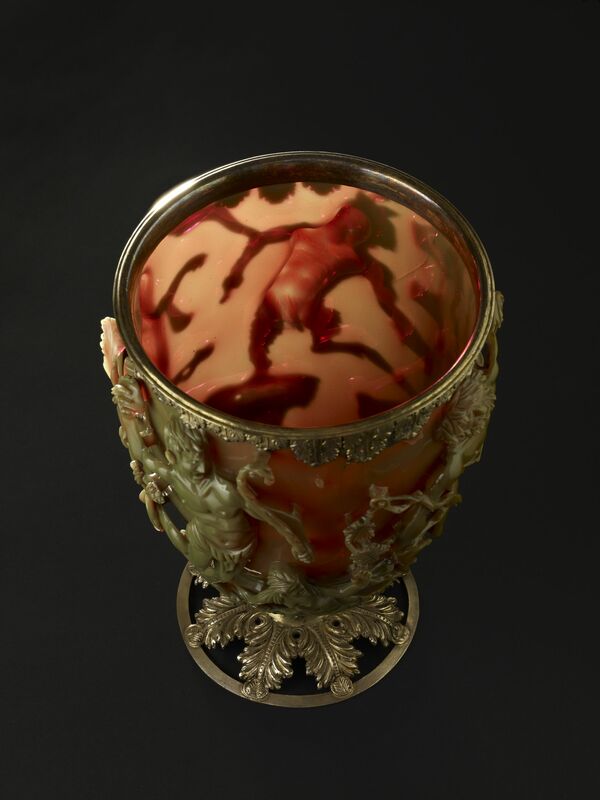 It’s also the only diatretum, or cage cup — a cup decorated by grinding away parts of a thick glass blank leaving a decorative relief connected to the new surface of the glass — existing today that has a figural design rather than a geometric one. It’s microscopic particles of gold and silver included in the glass during the molten stage that create the dichroic effect. The glass-maker added 330 parts per million of silver and 40 ppm of gold, but just adding tiny amounts of precious metals to the glass would not create a dichroic effect. The key intermediate step is when the silver and gold form into submicroscopic crystals called colloids which precipitate in the glass forming an alloy. These crystals scatter reflected light fairly evenly. In transmitted light, the crystals scatter blue more effectively than red, thus making the glass look red to the viewer. The artisanship this required boggles the mind. 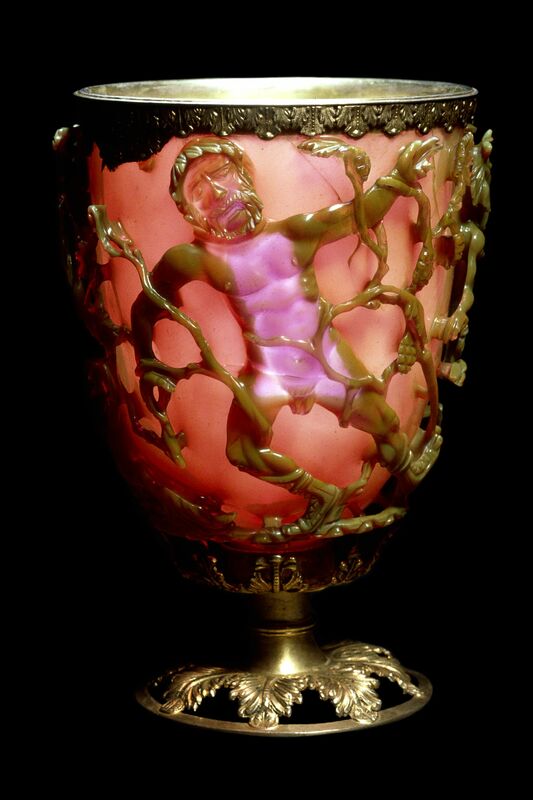 The glass makers could not have added such minute amounts of gold and silver just to the glass the cup was going to made out of. These particles are 70 nanometers wide. You can’t even see them with an optical microscope, never mind the human eyeball; you need a transmission electron microscope at least. Experts believe the craftsmen added the minimum possible of the metals and then diluted the glass-melt with more and more glass until they had the proportion right. 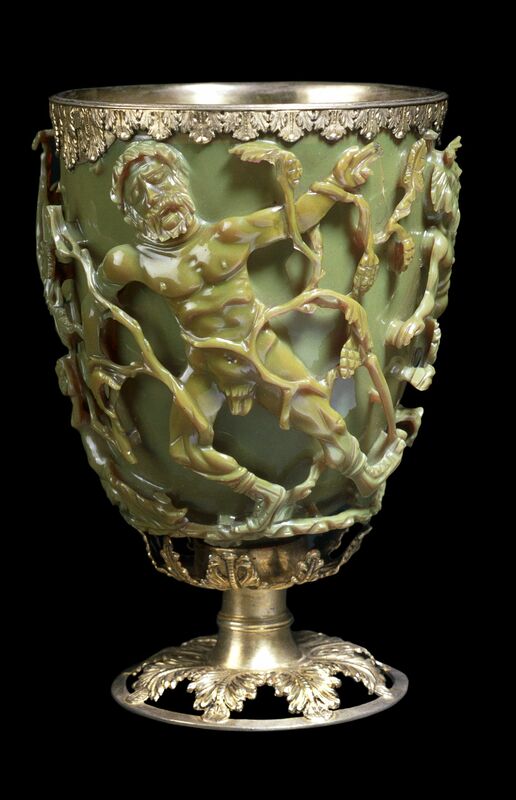 On the Lycurgus cup, these bridges are grape vines and other figural elements. It depicts an unusual mythological scene from the story of King Lycurgus of Thracia. Lycurgus banned the worship of Dionysos in his kingdom. When the wine god and his entourage showed up in Thracia, Lycurgus flew into a range. Driven by his violent temper, the king attacked the maenad Ambrosia. She cried out to Gaia for help and was transformed into a grape vine and wound herself around Lycurgus, trapping him. The cup shows Lycurgus thrashing in the vine while Dionysos dispatches a goat-legged Pan and a full-human satyr to torture the trapped king. There are many versions of the Lycurgus story, but this particular one has no exact parallels in Roman art. 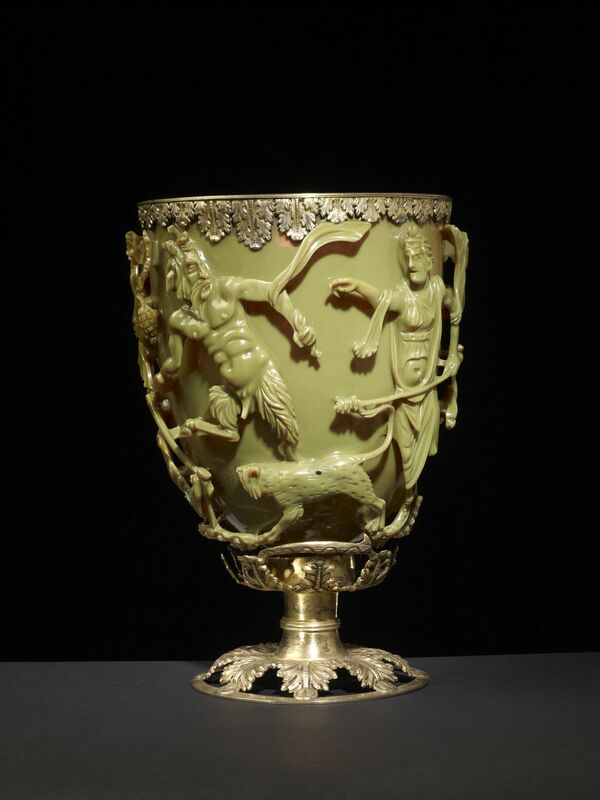 The cup may have been used in Bacchic rituals which were still in practice in fourth century Rome. In addition to the story the cup tells, the color shift from green to red parallels the maturation of the grape. Historians have also posited that it might be a political reference to Constantine’s defeat of Licinius in 324 A.D. It was certainly a specific commission and a hugely expensive one at that, with everything from glass color to theme to decoration being top of the line and one of a kind. 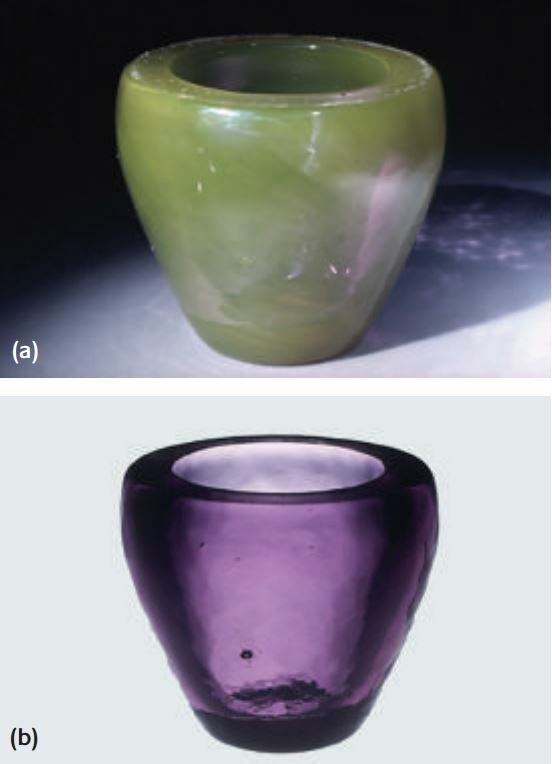 Vopiscus described dichroic glass cups in “The Lives of Firmus, Saturninus, Proculus and Bonosus” from the Historia Augusta. He quotes a letter purportedly written by the emperor Hadrian to his brother-in-law Servianus, husband of Hadrian’s elder sister Aelia Domitia Paulina. I am sending you over some cups, changing colour and variegated, presented to me by the priest of a temple and now dedicated particularly to you and my sister. I should like you to use them at banquets on feast-days. The letter is probably a fake. Hadrian goes on a rant against Egyptians, accusing them, among many other charges, of saying mean things about his adopted son Lucius Verus as soon as he left the country, but Hadrian was in Egypt in 130 A.D. and he only adopted Verus in 136 A.D. It does, however, indicate that Vopiscus was aware of cups made of dichroic glass and that they were the kind of thing emperors would send to their family members to use in religious rituals. Now there are a billion of them on an inch of plastic that might diagnose illnesses around the world for a negligible sum.